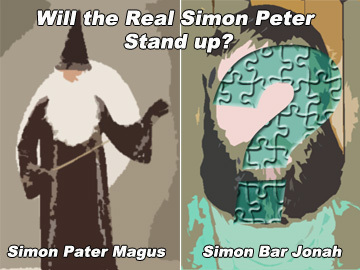 Will the Real Simon Peter Please Stand Up? The Roman Catholic Church claims Simon Peter went to Rome and founded its church. But, Simon Peter Bar Jonah never went to Rome, as was commanded by Jesus. “These twelve Jesus sent forth, and commanded them, saying, Go not into the way of the Gentiles, and into [any] city of the Samaritans enter ye not: But go rather to the lost sheep of the “House of Israel” (Matt. 10:5-6).” These twelve are specifically named in the previous verses of which Simon Peter is named first. And Romans were Gentiles. Shortly after Jesus’ ascension, He chose Paul to minister to the Gentiles. Paul, who was not one of the twelve, but a Roman citizen, would be charged with this mission. “… for he (Paul) is a chosen vessel unto me, to bear my name before the Gentiles, and kings, and the children of Israel (the lost sheep of the 10-tribed ‘House of Israel’): For I will show him how great things he must suffer for My name’s sake (Acts 9:15-16).” Paul, who was previously called Saul, had tortured Jesus’ followers, but was spiritually reborn and made an apostle. Simon Peter was an apostle to the Jews, as outlined by Paul in Galatians; “But contrariwise, when they saw that the gospel of the uncircumcision was committed unto me, as [the gospel] of the circumcision [was] unto Peter; (For he that wrought effectually in Peter to the apostleship of the circumcision, the same was mighty in me toward the Gentiles:). And when James, Cephas, and John, who seemed to be pillars, perceived the grace that was given unto me, they gave to me and Barnabas the right hands of fellowship; that we [should go] unto the heathen, and they unto the circumcision (Gal. 2:7-9).” Simon Peter’s “mission territory” is documented in the Book of Acts. He went to Lydda, to Joppa, to Caesarea, and back to Jerusalem; and his actual tomb was found to be in Jerusalem around 1960. In Galatians, Paul also mentions staying with Simon Peter for 15 days when he went to Jerusalem, during the same time period Catholics claim Simon Peter was in Rome. Paul also wrote in his letter to the Romans, “Yea, so have I strived to preach the gospel, not where Christ was named, lest I should build upon another man’s foundation: (Romans 15:20).” Apostle Paul wouldn’t need to go to Rome if Apostle Simon Peter were already there. Paul writes a letter to Romans while he was in Corinth, “So, as much as in me is, I am ready to preach the gospel to you that are at Rome also (Romans 1:15).” He ends the letter by sending salutations to no less than 25 individuals he knows in Rome. Not once does he mention his friend Simon Peter. If Jesus commanded Simon Peter to not go to the Gentiles, it is most unlikely Simon Peter disobeyed Him and went to Rome to set up house and a priesthood. Simon Peter was a Jew; and Rome would soon legislate that Jews were to vacate Rome. Christ was always one step ahead, thus He was more likely to use someone on the inside, as He did Paul, who was a Roman citizen, for this mission. Thus, it’s not surprising that Paul would become a “legendary” rival of another – that one being Simon (PATER) Magus who did go to Rome. He is mentioned in Acts: “But there was a certain man, called Simon (PATER), which beforetime in the same city USED SORCERY, and bewitched the people of Samaria, giving out that himself was some great one: To whom they all gave heed, from the least to the greatest, saying, This man is the great power of God. And to him they had regard, because that of long time he had bewitched them with sorceries. But when they believed Philip preaching the things concerning the Kingdom of God, and the name of Jesus Christ, they were baptized, both men and women. Then Simon himself believed also: and when he was baptized, he continued with Philip, and wondered, beholding the miracles and Signs which were done (Acts 8:9-13).” This Simon (PATER) was reprimanded by the true Apostles, because he tried to buy the ability to impart the Holy Spirit, as stated in Acts. In Acts, Simon PATER Magus is described with grand ideas about himself. He was able to use magic to gain followers, but he was not among the chosen apostles; and he did not possess the power of the Holy Spirit, saying, “Give me also this power, that on whomsoever I lay hands, he may receive the Holy Spirit”; but the real Simon Peter accursed him, saying, “Thy money perish with thee, because thou hast thought that the gift of God may be purchased with money. Thou hast neither part nor lot in this matter: for thy heart is not right in the sight of God. Repent … For I perceive that thou art in the gall of bitterness, and [in] the bond of iniquity (Acts 8:19-24).” Apostles John and Simon Peter were called to Samaria by Philip. He preached Christ there and healed many, and was trying to overcome the false teaching of Simon PATER Magus, and needed their help. They went to his aid. They no doubt rebuked PATER while they were there. Although there are discrepancies on how Simon PATER Magus died and legends created about his life, church historians, such as apologists Justin Martyr and Irenaeus, place him in Rome after being cast out by the Apostles, noting that he called himself the Father, the Son and the Holy Spirit. He also performed magic; and people regarded him as some sort of god. Writers of the early church represent Simon PATER Magus as the “Father of Heresies”, opposing the doctrine of the Apostles. Simon Pater-Peter Magus was probably the leader of the “Petrine” faction that opposed a “Pauline” faction of the early church. From Scriptural accounts, Paul already opposed another “gospel” as previously mentioned. Some believed the true gospel through Paul and some believed another through Simon PATER, who would be re-titled “Simon Peter”, as “Peter” is a title. Again, the real Simon Peter bar Jonah didn’t go to Rome, and thus wasn’t the faction against Paul’s. Plus, two real Apostles wouldn’t be in opposition to each other anyway. A developed system of doctrine in Rome was attributed to the Simon Peter, which must be Simon PATER’s. He proclaimed himself to be the “Standing One”, the principal emanation of the Deity and the Redeemer. In Pseudo-Clementine literature, it is said he considered himself to be even higher than God, the Creator. It sounds like he is one big fake, an illusion of Christ, a fake apostle transformed into his “grand idea about how special he is”. This literature did say he preached righteousness and judgment, but that it was bait. Who would do something like that other than Satan? A man listening to him, learning from him, becoming essentially his son – son of the Destroyer that Paul warned about in Second Thessalonians 2:3-4. Who would take Christ’s message and distort it for his own gain? Satan and his son. Again, “Peter” was a title. And this title would confuse the masses, as probably hoped for and planned by those who liked the prestige and power they gained through creating a fake religion with them in charge instead of God, or Christ’s message. They probably went so far as to call PATER “lord”– their dark lord who taught them sorcery. In Egypt, interpreters were called “petr”. In Greece, the pagan temples were named after peters, such as the temple of Elis being called Petron and Pytho at Delphi being called Petraessa. Even the temple dedicated to Apollo in Asia Minor was called Patara and its oracle called Patareus. 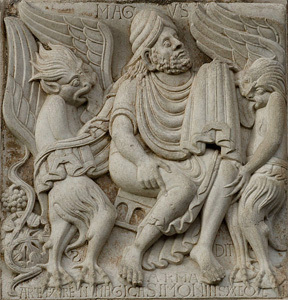 Simon Magus, Demons and The Birth of Wine on the Miegeville’s Gate of the Saint Sernin Abbey in Toulouse, France (Pierre Selim, Wikimedia Commons) Deut. 32:33 Their wine [is] the poison of dragons (Rev. 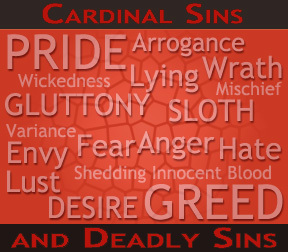 12:9, 13, 17), and the cruel venom of vipers (Matthew chapters 3:7; 12:34; 23:33). Church historian Hippolytus writes of Simon’s followers: the “Simonians” believed in free love and the magic arts; and that they also had images of Simon (and his lover) in the form of Zeus and Athena, but that no one was to call them by these names, because they would “show ignorance of the mysteries”. What, their mystery religion of bait and switch, luring people in, then secretly turning them into pagans? Was Simon PATER Magus the original opportunist? Interestingly, Zeus is known as the Greek “father” pagan god; and his son Apollo is “god of light and the sun”. What’s more interesting is that Apollo’s name is associated with the verb “apollymi” which means to destroy. “And they had a king over them, [which is] the angel of the Bottomless Pit, whose name in Hebrew [is] Abaddon (Destroyer), but in Greek [his] name is Apollyon (Destroyer – Satan) (Rev. 9:11).” Satan knows to destroy something utterly, one has to destroy it from the inside-out. He filled Simon PATER Magus with grandiose ideas; and together they started a universal religion called Catholicism to destroy Christ’s message. While Simon Peter was a “little stone”, Simon PATER Magus was a little snakester, who fashioned himself into an apostle; and began a cult that turned into a legion. This legion crafted a grand illusion– “their Christianity”, which is in opposition to Christ’s teachings and Father’s Law. Christ taught to return to the Covenant. He renewed it, giving Israel yet another chance to forsake all others. With a renewed understanding of God’s Law, Christ was the Rock of their Salvation. The Catholics have since written their own doctrine, or bull. With their “petrine primacy”, they say Simon Peter was the most prominent apostle of all. They claim to be Peter’s successors, with the highest-ranking ones being infallible– which is odd, because even the disciples made all kinds of mistakes and they walked directly with Christ. The writings of Apostle Paul would get in the way of Christ’s true message, in that the snakesters would start basing beliefs and duties on what they claim Paul wrote; when they should have been solely concentrated on what Christ taught, keeping it simple. Christ said, “But be not ye called priest (etc. ): for One is your Teacher, [even] Christ; and all ye are brethren. And call no [man] your father upon the earth: for one is your Father, which is in heaven. Neither be ye called masters: for one is your Master, [even] Christ (Matt. 23:8-10).” THIS WAS NOT A PARABLE, BUT A COMMAND. Maybe the founders of Catholicism thought that with enough babble, their replacement doctrines would universally confuse the masses. Haven’t they programmed their masses to believe that the Holy Bible is heresy? Ask a Catholic to read the King James Version of the Bible, see what kind of response you get. Christ’s apostles went about building a community of believers (church), not a building or organization, or a fortress, passing down the traditions of men, writing protocol outside of God’s Law, such as Canon Law and this doctrine: “Plainly therefore we ought to regard the bishop as the Lord Himself” – Epistle of Ignatius to the Ephesians 6:1. Or “follow your bishop, as Jesus Christ followed the Father, and the presbytery as the Apostles; and to the deacons pay respect, as to God’s commandment” – Epistle of Ignatius to the Smyrnans 8:1 (Source: Bishops on Wikipedia). Or claims like, “The pope is of so great dignity and so exalted that he is not a mere man, but as it were God, and the vicar of God” found in their many works. Even John Paul in his, “Crossing the Threshold of Hope”, wrote that his followers should not be afraid to call him Holy Father. Jesus warned against following the traditions of men. Those traditions sent Him to the cross, remember? Specifically, He was referring to Talmudic Jews, and their lawbook, which was based on the Babylonian Talmud. They were following it instead of the Torah, just like they still do today. 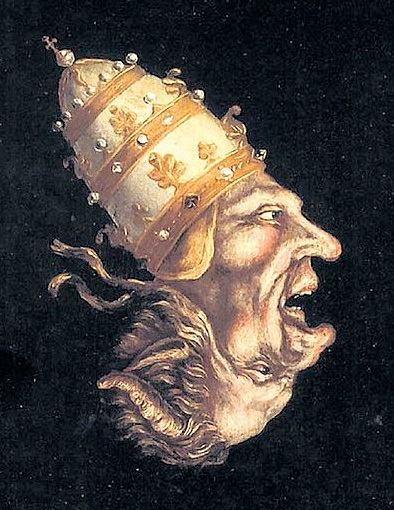 Catholics follow their own traditions, with their elders of popes, cardinals and bishops, not to mention the strategizing generals behind the scenes conjuring up the protocols. Maybe they are modern wizards practicing the magic arts, using only a dark veil as a degree of separation. One thing is for sure. They have loads of doctrine to “explain” their highness. The church has three pillars of Tradition, Scripture and Magisterium, The Magisterium is the “teaching authority” with power to authentically understand and teach the truths found explicitly and implicitly in Tradition and Scripture. That’s a scary thought by itself, but the Magisterium is full of mind-boggling explanations about how it’s infallible. But just because they write whatever they say is the truth, doesn’t mean it is. Incidentally, the word magisterium can be traced back to the word “master”. And Rabbi also means master. Even the rock they base their church on is a lie. Jesus nicknamed Simon bar Jonah Cephas (Petrus) which means “a little stone or pebble” NOT Petra which means rock. In fact, the Bible contains many references to Christ being the Rock; and Christ is the Living Word, Truth. The Catholics base their claim on Matthew 16:18, “And I say also unto thee, That thou art Peter (Cephas – a little pebble or stone -John 1:42), and upon this Rock (the Truth – Matt. 7:24-27 that Peter had spoken) I will build my community; and the gates of hell shall not prevail against it.” The Rock was the Truth, that Simon Cephas/Peter just verbalized in the previous Scriptures, not him. “He saith unto them, But whom say ye that I am? And Simon Peter answered and said, Thou art the Christ, the Son of the Living God (the Rock; Truth or Corner Stone). And Jesus answered and said unto him, Blessed art thou, Simon Barjona: for flesh and blood hath not revealed [it] unto thee, but my Father which is in heaven. (Matt. 16:15-17).” Father had revealed the Truth to Peter’s spirit. It would be Truth that Christ would build His community on, not Peter, a man. The Catholics also claim that Simon Peter alone was given the keys to heaven (Matt. 16:19). Christ is the Key; and the Keys are Truths. Christ gave them to all the disciples who were charged with spreading the gospel. And the Keys are available to all souls, if they want the Truth; but because Christ holds them, it would require souls to believe Him, just as Simon Peter did, and return to the Covenant, just as they were commanded to do by Father – our Father who Christ continually says is in Heaven and knows all things. Nope John Paul II, Nope Benedict, Nope Francis and all the other nopes aren’t gods, but are impostors being called “Holy Father” on Earth; and they who love the uppermost rooms and chief seats. Babylon had its Ishtar; and Rome has its Madonna. Yes, they paganized Mary, putting a baby in her arms, just as Ishtar had Horus in hers. Well, baby Jesus grew up; and Mary went on to have more children. Thus, calling her a perpetual virgin is a lie. While Catholics have been enamored with Mary since the bait and switch, it was in 1954 that Nope Pius XII officially crowned her “queen of heaven”. In their pagan May festivities, they play merry-go-around and crown her graven images. Catholics worship her, petition her, light candles to her, and leave her gifts. They pretty much do all the things Babylonians used to do for Ishtar. Jeremiah warned Israelites to stop performing these exact same acts to their “queen of heaven” back in his day. 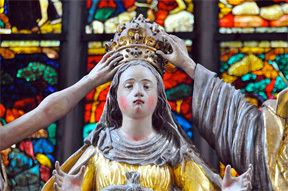 Many nopes have given tribute to Mary, calling her the Queen of Heaven and Earth, (Pius IX), Queen and Ruler of the Universe (Leo XIII) and Queen of the World (Pius XII). Instead of reading the pope’s bull-ony and other assumptions, it would be a good idea to read the Holy Bible. They also blasphemously call her the Mother of God, but she was only a faithful human-being chosen to carry the body-vehicle Christ would use. People were often chosen by what God saw in their hearts and minds, like He did Noah, Abraham and Moses. No one was chosen whose faith wasn’t tested. God melds those He chooses by testing their faiths, sometimes it can seem like a fiery baptism. Just like the Truth can set someone on fire, enlightening him. Christ said He would baptize with fire; yet man wants to imitate John the Baptist and use water, instead of Truth like Jesus did. From his “chair of Peter”, Pius XII defined the Assumption of Mary, their belief that Mary ascended into Heaven. Nope, that’s a fallacy, as Christ was the ONLY one who did that. Mary had to flee Roman persecution for being a Covenanter. She didn’t ascend; she escaped to Glastonbury, England with Joseph of Arimathaea, her uncle, and other disciples, as outlined in “The Truth About Glastonbury, Summerland” sourced below. Even early papal documents would later place her there. Mary is not a god. She was a humble, noble woman; who is only to be respected for her faith and obedience, not idolized as a deity. She disappeared off their radar, which is why she wasn’t martyred. At that time, the isles were free from Roman control. The disciples in the isles would become the Culdees, whose simple life was a far cry from the grandeur of Rome. Catholics make Peter out to be “the best or most favored” and place the pope’s supremacy on their belief that he was in some way superior to the others. But the truth is Simon Bar Jonah was far from perfect; and he was not placed above the others. Jesus’ half-brother James was the head apostle in Jerusalem; and John was the disciple “whom Jesus loved”. In Gethsemane, when Jesus’ heart grew heavy over the coming crucifixion, He went to pray alone; and when He returned, He found Peter and the disciples asleep three times and Peter was even called out, “And he cometh unto the disciples, and findeth them asleep, and saith unto Peter, What, could ye not watch with me one hour? (Matt. 26:40).” It was Simon Peter who denied Jesus three times, remember? Simon Peter could not tell Jesus that he loved Him. He was asked by Jesus three times if he loved Him, “… Jesus saith to Simon Peter, Simon, [son] of Jonah, lovest thou me more than these? He saith unto him, Lord; thou knowest that I like thee. He saith unto him… He saith to him again the second time, Simon, [son] of Jonah (Dove), lovest thou me? He saith unto him, Lord; thou knowest how much I like thee. He saith unto him… He saith unto him the third time, Simon, [son] of Jonah, lovest thou me? Peter was grieved because he said unto him the third time, Lovest thou me? And he said unto him, Lord, thou knowest all things. (John 21:15-17).” Sure, Jesus told him to go feed His sheep, as Simon Peter would still go on to be an apostle and teach the gospel to the Jews; and feed the sheep as did the others. Interestingly, Jesus’ interrogation of Peter was stolen out of the Book of Kells, along with John’s Third Book of Revelation and its cover. The Book of Kells was an ancient gospel compiled by Columba, the Irish prophet, who studied under the Culdees. Shall be the possession of worldly substance.